Old Persian inscription (DPe) of the Achaemenid monarch Darius I (522-486 BC) on the southern wall of the Persepolis terrace. Pārseh (Persepolis), Fārs province, Iran. Ca. 500 BC. §1. 1-5. I am Darius the Great King, King of Kings, King of many countries, son of Hystaspes, an Achaemenian. §2. 5-18. Darius the King says: By the favor of Ahuramazda these are the countries which I got into my possession along with this Persian folk, which felt fear of me (and) bore me tribute: Elam, Media, Babylonia, Arabia, Assyria, Egypt, Armenia, Cappadocia, Sardis, Ionians, **[those] who [are] of the mainland(? ), and [those] who [are] in the sea, and lands/countries which [are] beyond the sea**, Sagartia, Parthia, Drangiana, Aria, Bactria, Sogdiana, Chorasmia, Sattagydia, Arachosia, Sind, Gandara, Scythians, Maka. §3. 18-24. Darius the King says: If you shall think thus, 'May I not feel fear of (any) other,' protect this Persian people; if the Persian people shall be protected, thereafter for the longest while happiness unbroken -- this will by Ahura come down upon this royal house. After Kent, R. G. 1953. Old Persian: Grammar, Texts, Lexicon. 2nd ed. American Oriental Series 33. New Haven: DPe. Reproduced by permission of the American Oriental Society. **-** rendering Zournatzi 2016, forthcoming. The subjects of the Achaemenid rulers are often listed in the Achaemenid royal inscriptions (e.g., Herrenschmidt 1976: 53-60; Vogelsang 1992: 96-106; Lecoq 1997: 130-153) and depicted in royal monumental reliefs (e.g., Schmidt 1953: pls. 29-47; Walser 1966; Schmidt 1970: figs. 39-52; Roaf 1974; Shahbazi 1976: 41-46; Root 1979: 227-284). The written and visual representations of the composition of the Persian imperial domain commonly include references to groups of Greeks conquered by the Great Kings. 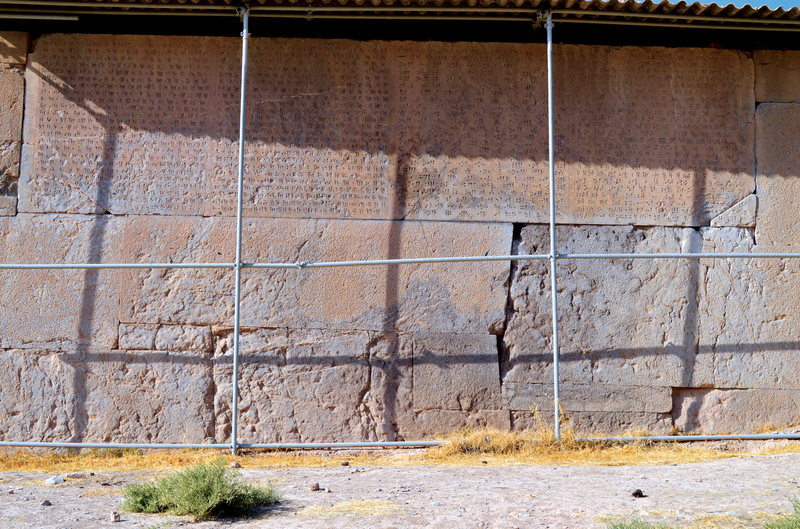 The present Old Persian inscription is one of four Achaemenid texts that are carved on the southern retaining wall of the Persepolis platform (Schmidt 1953: 63, pl. 7 [text B]; Kent 1953: DPe; Shahbazi 1985: 18 map 1, pls. I, II, VI; Lecoq 1997: 133, 228; Kuhrt 2007: 486-487; Schmitt 2009: 13, 117-119). It refers to various Greek subjects of Darius I by means of no less than three separate designations: Yaunā ('Ionians'), tyaiy drayahyā ('[those] who [are] in the sea'), and dahyāva tyā para draya ('lands/countries which [are] beyond the sea'). Yaunā is commonly interpreted as a cognate of the Greek ethnic Ἴωνες ('Ionians’) and as a generic name used by the Persians for all the Greeks (e.g., Kent 1943; Herrenschmidt 1976: 54-60; Calmeyer 1982; idem 1983a; idem 1983b; Lecoq 1997: 143; Sancisi-Weerdenburg 2001a: 11; eadem 2001b; Root 2007; Rollinger and Henkelman 2009). Persian terminology in this instance is always likely, however, to have been borrowed from the Assyrian-Babylonian, rather than the Greek, vocabulary (Mesopotamian references collected in Brinkman 1989; cf., e.g., Rollinger 2007). It may have thus preserved traces of earlier Near Eastern perceptions of the 'Ionians' as inhabitants of (eastern Mediterranean) island/coastal districts — districts, in which the Greek element left deep marks of its presence both before and during the Achaemenid period, but which, nonetheless, were not exclusively inhabited by Greeks (e.g., Casabonne 2004 and Muhly 2009; but see also Sakellariou 2009: vol. 2, 481-507, for a detailed overview of the ancient evidence and modern opinions about the origin and significance of the term). Mixed constellations of Greek and other ethnic groups are more readily perceptible in the references of the DPe inscription to (western) subjects ‘in’ and ‘beyond the sea’ (ll. 13-15). The label ‘(those) who (are) in the sea’ arguably designated collectively the sum of Darius’ insular subjects (such as Greeks, Cypriots and Phoenicians) in the Aegean and the southeastern Mediterranean (e.g., Zournatzi 2016, forthcoming). The 'lands/countries which/who (are) beyond the sea' must have encompassed, in turn, the Scythian, Thracian and Greek entities conquered by Darius in Europe (e.g., Herrenschmidt 1976: 57; Sancisi-Weerdenburg 2001b: 331). References to Greeks, possibly in all of the instances considered here, in terms of larger territorial groupings of mixed ethnic groups appears to be out of tune with the otherwise canonical references of the Achaemenid subject lists to named subject entities. However, in keeping, not least, with the requirements of the laconic idiom of the subject lists, these territorial groupings could be intended to provide epigrammatic descriptions of the geographically, ethnically and politically fragmented entities along and beyond the western shores of Asia over which the Persian kings ruled (cf. Kuhrt 2002: 21). At the same time, the ethnically vague designations of subjects ‘in’ and ‘beyond’ the sea could be meant primarily as grandiose statements of Persian imperial expansion beyond the shores of Asia (Zournatzi 2016, forthcoming). Brinkman, J. A. 1989. 'The Akkadian words for "Ionia" and "Ionian".' In Sutton, R. F. Jr. (ed. ), Daidalikon. Studies in Memory of Raymond V. Schoder, S.J. Wauconda, Illinois: 53-71. ——. 1983a. 'Zur Genese altiranischer Motive. VIII. Die “statistische Landkarte” des Perserreiches 2.' Archäologische Mitteilungen aus Iran 16: 109-263. ——. 1983b. 'Zur Rechtfertigung einiger grossköniglicher Inschriften und Darstellungen. Die Yaunā.' In Koch, H. and MacKenzie, D. N. (eds. ), Kunst, Kultur und Geschichte der Achämenidenzeit und ihr Fortleben. Archäologische Mitteilungen aus Iran, Ergänzungsband X. Berlin: 153-167. Casabonne, O. 2004. 'Rhodes, Cyprus and southern Anatolia during the Archaic and Achaemenid periods: the Ionian question.’ Colloquium Anatolicum III: 1-14. Herrenschmidt, Cl. 1976. 'Désignation de l'empire et concepts politiques de Darius Ier d'après ses inscriptions en vieux-perse.' Studia iranica 5: 33-65. Kent, R. G. 1943. 'Old Persian texts, IV. The list of provinces.' Journal of Near Eastern Studies 2: 302-306. Kuhrt, A. 2002. ‘Greeks' and 'Greece' in Mesopotamian and Persian Perspectives, a lecture delivered at New College, Oxford, on 7th May, 2001. The Twenty-First J. L. Myres Memorial Lecture. Oxford. ——. 2007. The Persian Empire. A Corpus of Sources from the Achaemenid Period. London and New York. Lecoq, P. 1997. Les inscriptions de la Perse achéménide. Paris. Muhly, J. 2009. 'The origin of the name “Ionian”.' In Karageorghis, V. and Kouka, Ou. (eds. ), Cyprus and the East Aegean. Intercultural Contacts from 3000-500 BC, an international archaeological symposium held at Pythagoreion, Samos, October 17th - 18th 2008. Nicosia: 23-30. Roaf, M. 1974. 'The subject peoples on the base of the statue of Darius.' Cahiers de la Délégation archéologique française en Iran 4: 73-159. Rollinger, R. 2007. 'Überlegungen zur Frage der Lokalisation von Jawan in neuassyrischer Zeit.' State Archives of Assyria Bulletin 16: 63-90. Root, M. C. 1979: The King and Kingship in Achaemenid Art. Essays in the Creation of an Iconography of Empire. Acta Iranica 9. Leiden. ——. 2007. ‘Reading Persepolis in Greek: gifts of the Yauna.’ In Tuplin, C. (ed. ), Persian Responses: Political and cultural interaction with(in) the Achaemenid Empire. Swansea: 177-224. Sakellariou, M. B. 2009. Ethne grecs à l'Âge du Bronze, 2 vols. ΜΕΛΕΤΗΜΑΤΑ 47. Athens. Sancisi-Weerdenburg, H. 2001a. 'The problem of the Yauna.' In Bakɩr, T., Sancisi-Weerdenburg, H., Gürtekin, G., Briant, P. and Henkelman, W. (eds. ), Achaemenid Anatolia. Proceedings of the First International Symposium on Anatolia in the Achaemenid Period, Bandɩrma 15-18 August 1997. Leiden: 1-11. ——. 2001b. 'Yaunā by the sea and across the sea.' In Malkin, I. (ed. ), Ancient Perceptions of Greek Ethnicity. Cambridge, Mass., and London: 323-346. Schmitt, R. 2009. Die altpersischen Inschriften der Achaimeniden. Editio minor mit deutscher Übersetzung. Wiesbaden. Shahbazi, A. S. 1976. Persepolis Illustrated. Institute of Achaemenid Research Publication IV. Tehran. ——. 1985. Old Persian Inscriptions of the Persepolis Platform. Corpus Inscriptionum Iranicarum, part I, vol. I, portfolio I. London. Vogelsang, W. J. 1992. The Rise and Organisation of the Achaemenid Empire. The Eastern Iranian Evidence. Leiden, New York, Köln. Walser, G. 1966. Die Völkerschaften auf den Reliefs von Persepolis. Historische Studien über den sogenannten Tributzug an der Apadanatreppe. Teheraner Forschungen herausgegeben vom Deutschen Archäologischen Institut, Abteilung Teheran, Bd. 2. Berlin. Zournatzi, A. 2016, forthcoming. 'Cyprus in the Achaemenid rosters of subject peoples and lands.' Proceedings of the International Symposium ‘Les royaumes de Chypre à l’épreuve de l’histoire: transitions et ruptures de la fin de l’âge du bronze au début de l’époque hellénistique’, Athènes, 19-21 mars 2015. Bulletin de correspondance hellénique, Supplément.